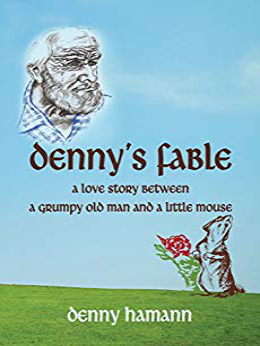 Welcome to the world of Denny’s Fable. This is a story for grown-ups, and those that never did. It is a story of childhood fantasies that all adults carry, tucked carefully away, in the dark corners of our minds. It is a story of an old man, who believes himself to be a wise man, in search of that elusive treasure – happiness. In his search, he discovers he has not been a wise man, but a fool. A fool who has been “shat” upon repeatedly. But in his search, he discovers a special treasure. A very dear friend, in the form of a little field mouse. It is his little furry friend who shows the old man where happiness lies, and always has been. In his own field of beauty. It is a story of all of our lives and our struggles. A story that is repeated, over and over again, in as many lives as there are people who seek the truth. It is a story of love, and joy, and sadness. It is a story of philosophy, psychology, and man’s search for meaning. In other words – – a story of life. A story about me. A story about you. It is written at two levels. A fantasy, that can never be true, but with a message that pries deep into your subconscious. A message designed to move you. The artwork is intricate, and in itself, a masterpiece that adds significantly to the story. The complete manuscript is about 175 pages in length, with some 45 illustrations. In the enclosed manuscript, you will find; the beginning, a significant passage midway through the book, and the ending. I hope you like what you read, and are moved to read more. I look forward to your thoughts and comments. It is my sincere wish, that this has been a very good day for you. in a place, not so very far away, just over the ridge where the eye cannot see, but your mind knows how to find the spot, there lived a wise man who was growing older. He had seen many things, and experienced much. In his journey to seek truths, he discovered a young man, also on a journey. “Where do you travel, my friend?” asked the wise man. “Hither and yon, and over hill and dale.” replied the young man. “May I walk with you for awhile?” asked the wise man. “I do?” questioned the lad. “I have no package.” replied the man. “I do?” asked the young man. “But I cannot fly.” said the young man. “I believe this is where our paths separate.” said the young man. “Goodbye.” said the young man. “Have a good day.” said the wise man. “Same to you.” said the departing figure of youth. “What are you doing, my friend?” asked the field mouse. “Why do you have the large gunny sack open, with your eyes looking toward the heaven?” asked the little mouse. “Hush.” said the wise man. “You are distracting me, and I may miss catching my package of happiness as it falls from the sky.” and he kicked at the little mouse. “Are you not happy?” asked the mouse. “Did the young man say he would deliver the package today?” asked the mouse. “I only know from my own experiences, and learning from those of others.” said the mouse. “And what do you learn of mine?” asked the wise man. “I fear it is not a plane, my friend, but only a bird soaring. An illusion of a plane.” said the mouse. The wise man stood stunned. His head, still turned toward the heavens. His arms, outstretched, holding an open, empty gunny sack, and a small white spot, becoming larger, on his forehead. He slowly lowered his head, and looked at his feet, for they too had been soiled. Then, slowly, he sank to the ground, and sat with bowed head. His arms wrapped around his knees; and if you really listened; really listened hard – – above the noise of the breeze, whispering through the grasses and flowers – – if you listened, really listened, above the rustling of the leaves – – if you really listened – – you could hear the soft sobbing of a broken man. The soft whimpering sob from the very depths of one’s being. And the tears dropped silently by his feet, glistening in the grass, catching each ray of sunlight, and bursting it into a rainbow of colors. “I am not loved.” said the wise man. “Oh my friend, but you are. Can you not see?” said the mouse. “Who would love me?” asked the man. “I would, and I do.” replied the mouse. “Why should I not love you?” asked the mouse. “Ah, there are so many reasons why you should not, that I could spend endless days telling you all the bad I see, both within and without.” replied the man. “You cannot find it,” said the little mouse, “because you do not choose to look. You do not choose to see. You cannot see through other people’s eyes, for they are not you. You cannot hear through their ears, for they may listen for different things, and not hear as you do. You cannot live your life through another, for they have their’s to live, as do you – – and each life is unique – – irreplaceable. We cannot use other people’s eyes, and ears, and hearts, and lives to show us the good. We must use our own eyes and ears and hearts and lives to discover the world. Our world. To look for it with all the tools available to us. To seek it with fervor, and with our very being. It is not hard to find, when we use our own tools. Not hard at all.” said the little mouse. “Oh, my friend,” responded the mouse, “you have seen, and heard, and felt all of these things before. It’s just that somewhere, somehow, someplace, someone told you those experiences are all foolishness. They do not belong in the world of men. Certainly not in the world of wise men, but only in the world of fools. Men do not see, and hear, and feel like that. Now if you are to be a man – – a real man – – here is how you must see – – and how you must hear – – and how you must feel. Only fools see the things real men do not look for. Only fools hear the things real men do no listen to. Only fools feel, deep within, experiences in life real men do not seek. The real men of the world will gaze up unto the heavens, walking with outstretched arms, holding an open, empty gunny sack, waiting for their package to fall from the sky. And they shall walk with courage through the manure of the field, and have birds shat upon their foreheads. Now, I ask you, my friend, who is the fool?” asked the mouse. “I cannot do that.” said the old man. “Why not?” asked the mouse. “What would they say?” asked the mouse. The old man looked at his new found friend through puzzled eyes. He scratched the hairs on the back of his head, and looked up to the sky. He looked back at the mouse as his friend began to speak. And the old man slowly lowered himself onto the field of beauty, so that he might be closer to his new found friend – – so that he might listen to the words that were spoken, and perhaps, just perhaps, for the first time in his life – – to listen, and really hear what another truly was saying. To listen with his third ear. The old man rested on his hands and knees beside the mouse. And the old man lay down. No, perhaps a better description is that the old man hugged the earth, and joined the little mouse at his level, and the two were equal. “What if someone comes along and sees me laying in the field?” asked the man. “What if?” replied the mouse. “Well, they might think – – they might think – – I’m not sure what they might think, except that someone is laying in the field.” said the old man. “Would their label hurt?” asked the mouse. The two lay in the grass on their stomachs, their heads propped up on supporting hands. Looking at each other. Listening. Thinking. “Do you want to die?” asked the mouse. “Do you find life worth living?” asked the mouse. “Are you getting all that you want out of life?” the little mouse asked. The old man opened his eyes and furrowed his brow. “No, I’m not getting all that I want out of life.” He began to sit up, but then slowly rested his head back on his hands. “No, I’m not getting all that I want out of life. I’m sure that there must be more – – but I don’t know what it is. Maybe I don’t even know what it is that I’m looking for. If I knew, then it might be easier to find. That’s an interesting question – what is it that I want out of life? What do I want? What do I really want? – – I don’t know.” And he closed his eyes again. “Do you see others around you getting more out of life – – than you? Are they getting more? Are they enjoying living – – more than you?” asked the mouse. The old man closed his eyes tighter, and pulled his lips together – tighter. “Yes.” said the old man quietly. The old man closed his eyes and pursed his lips ever so tighter. His chest rose and fell with an increased breathing rate. A lone solitary glistening spot grew larger at the corner of one tightly closed eyelid, and slowly traced a pattern down his cheek and disappeared near his ear. He took a final deep breath – his chest rising to its fullest, and as he exhaled, you could hear a silent shudder in his breath. “No.” he whispered softly. “No – – I do not like myself.” And he slowly shook his head as he replied. The old man lay in the grass. His eyes tightly closed. A slow, but steady bead of a tear formed near his ear – then disappeared, only to reform. The two lay there – – in that field of beauty – – for a long time. Not saying anything. Just laying there. The gentle rays of the sun warming them in their light. It felt good – – to be alive. 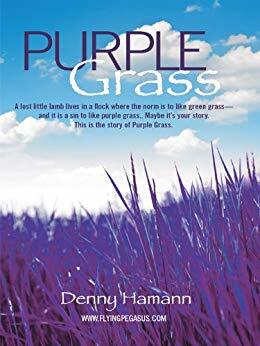 © , Denny Hamann, All rights reserved.